The Troy-Bilt Storm Tracker 2890 Track is one of those snow blowers that you can’t get at your favorite big box store. Troy-Bilt dealers are getting so hard to find that you may not even know this model exists. But it does and one of the best track drive snow blowers around for the price. It is actually very easy to purchase and have delivered right to your house for free. 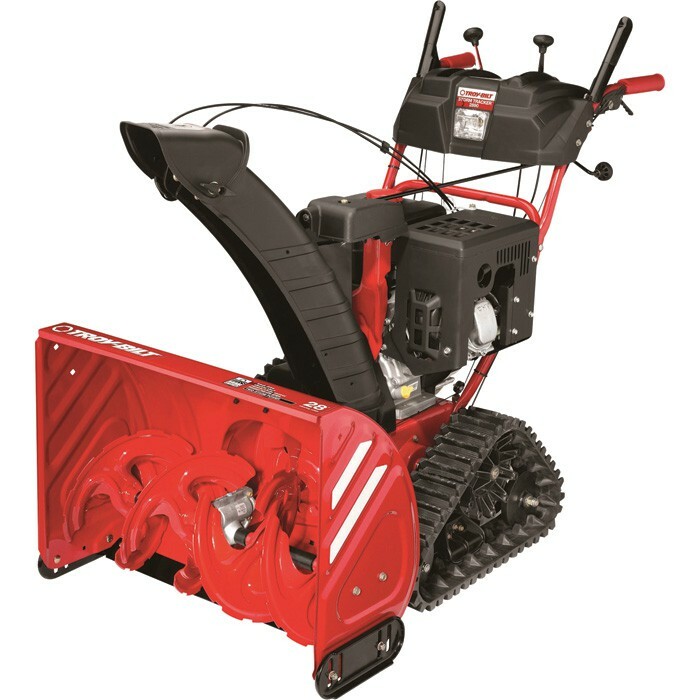 The Troy-Bilt Storm Tracker 2890 Track Model 31AH74P4766 is essentially a 28 inch, 277 cc Troy-Bilt Storm 2840, Cub Cadet Snow Removal 28 in. 277 cc Two-Stage Electric Start Gas Snow Blower with Power Steering 2X 528 SWE or a Craftsman 28 In 277cc* Dual-Stage Snowblower w/ EZ Steer with tracks and an easy to use chute control. This is a better snow blower than the Troy-Bilt XP Storm Tracker 2690 XP sold at the big box stores. The 2690 has too small of an engine for most of us. A track drive has the best traction under all conditions. With a simple lever you can adjust the front height for your cement drive, your gravel drive and scraping hard packed snow off your drive. With the lever you can raise the front off the ground for moving it from one drive to the next. This snow blower works particularly well for cleaning off your lawn for your dogs or cleaning snow off your skating rink out on the lake. 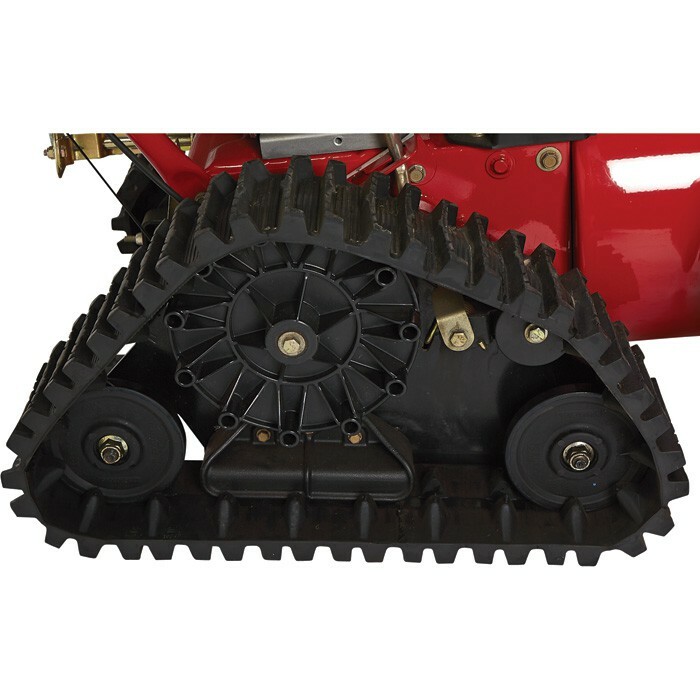 The 3-point tracks are a big improvement over the older Troy-Bilt tracks. Internally it is the same bulletproof system that has been around for years. This snow blower uses the “quick chute” control like the Craftsman 88173. Three turns swing the chute from side to side. It is easier to use for most of us than the 4-way chute. It also has remote defector control. The 277 cc engine gives you plenty of power for most snows. The 277 cc is very economical on fuel. The heated hand grips work well on this snow blower. The price. Good Track Drives are expensive. This one at $1299 is a very affordable and a good residential value. Track drives are awesome but they don’t go up steps. This snow blower is balanced well enough that you can go down steps, but not up them. Track drives don’t move well with the engine turned off. I actually have a furniture Mover’s Dolly that I place my track drives on in the summer so I can move them around the garage. The best place to get this snow blower is through Northern Tool. Northern Tool will ship this snow blower for FREE nationwide. Northern Tool has a stellar reputation for getting the snow blower to you in perfect condition. Here is a typical review: “ shipped when available and received damage free – will buy again from northern tool ” I have been shopping there for many years and have never had an issue with their service. They are a great company to work with. When you order from Northern Tool the snow blower will arrive in a shipping box. It will take you about 15 minutes to get it out of the box, raise the handles and install the discharge chute. You don’t need any tools but I do recommend a pliers to install the locking clip on the chute mounting pin. Oil is in it already – just gas and go. Buy Here With Free Shipping! 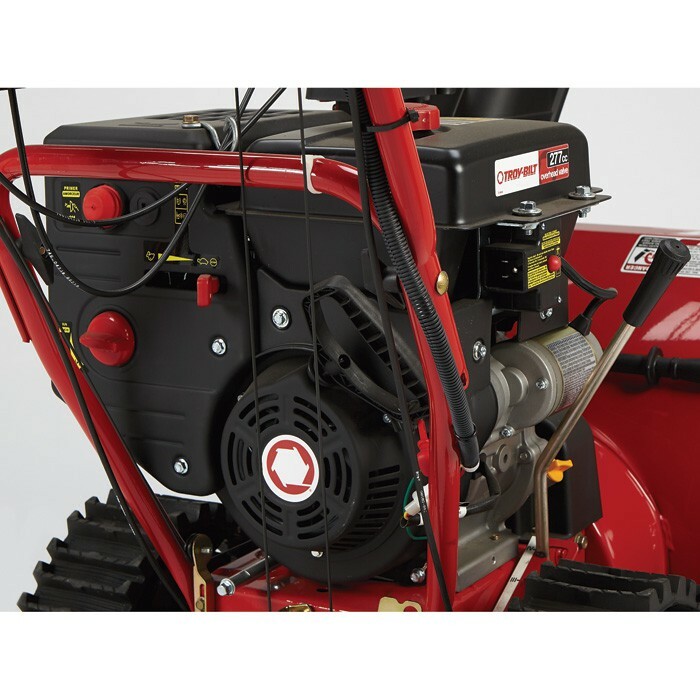 Husqvarna 200 series belts, Toro SnowMaster and other stuff. Paul, what slope of driveway is considered “steep”? Hi John, Any snow covered slope you would feel uncomfortable walking up in street shoes. 10 degrees on a snow covered driveway is about all a snow blower can go up. I am warring on tracked drive vs wheels. I spoke to some local dealers and they said tracks just aren’t necessary here even with a long steep driveway. If I were to look at a wheeled machine for my 200 foot driveway that goes downhill from my house what would you recommend. The black top is old and broken up with patches, tree root bulges and it is uneven with hump in the middle and canyons on either side where the oil trucks have worn down the driveway. Because of the unevenness I have been wary of Arien’s autoturn. Right now $1600 or so is my target ceiling but could be persuaded up to $1800. Hi Brian, I don’t have a recommendation for you. I suggest you go back to those local dealers and buy what they suggest. It appears they know you driveway well and they can help you make the best decision. Hi Brian, The StormTracker 2890 is a good residential snow blower. It has a long history and works well. 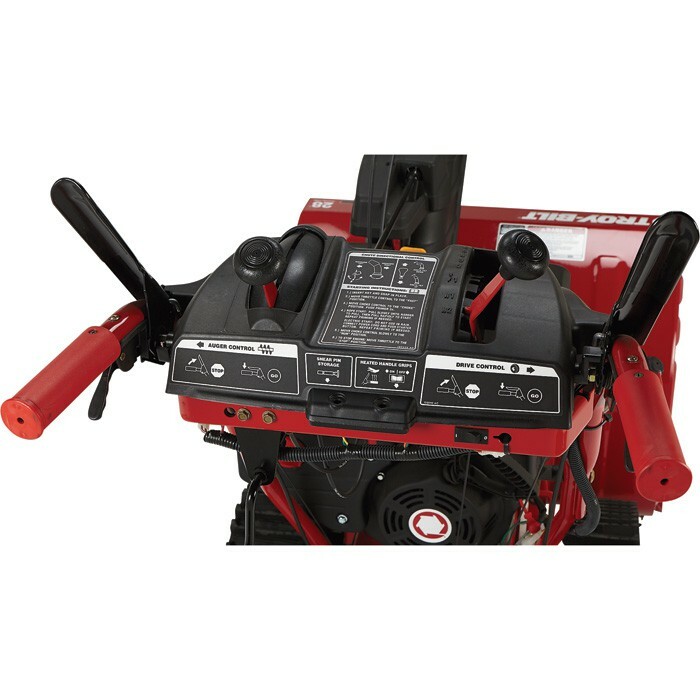 There are only 2 other options under $2000 – a 208 cc storm tracker that is underpowered and a Chinese built Dirty Hand Tools with no “track record” All the other track drive units are heavy-duty and cost about twice as much. I don’t know if the 2890 is best for you. Your average snowfall tells me a residential unit is the right choice but if your driveway is more than 200 feet long you may still want to go with a heavy-duty unit. Why? For long life. The 2890 is a good snow blower for steep driveways in the 20 X 150 range. Used on that sized drive it will last you 10-15 years with little maintenance. On the other hand, a heavy duty machine like the Husqvarna ST330T will handle a drive twice that big for 10-15 years. That is why the Husqvarna is almost twice the price. Hi Brian, If you get 80 inches of snow or more than consider the 3-stage. Otherwise you will happier with the 2-stage over the years. The biggest issue with the 3-stage MTD is they don’t clear 2-4 inches well – they splatter it out the front and leave a pile when you are trying to clean up corners.